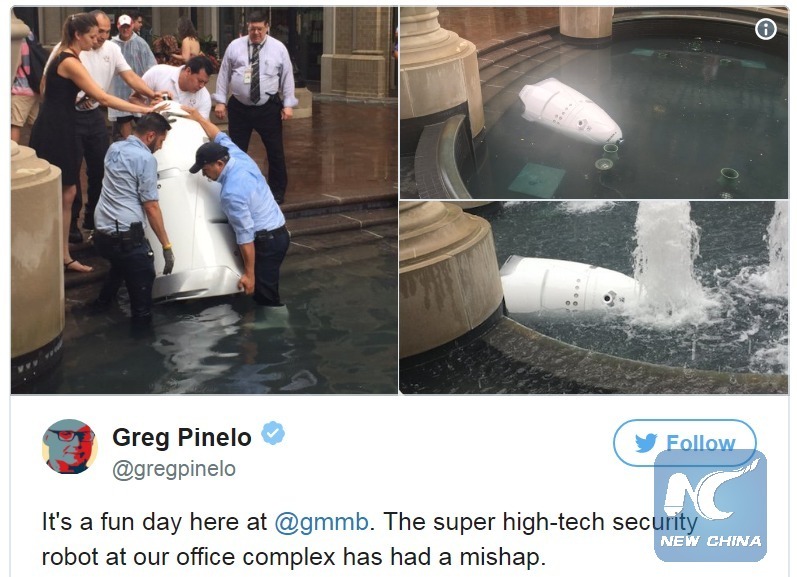 WASHINGTON, July 18 (Xinhua) -- A robot security guard supposedly on a lookout for crime in a shopping complex drowned itself by toppling over into a public fountain here on Monday. 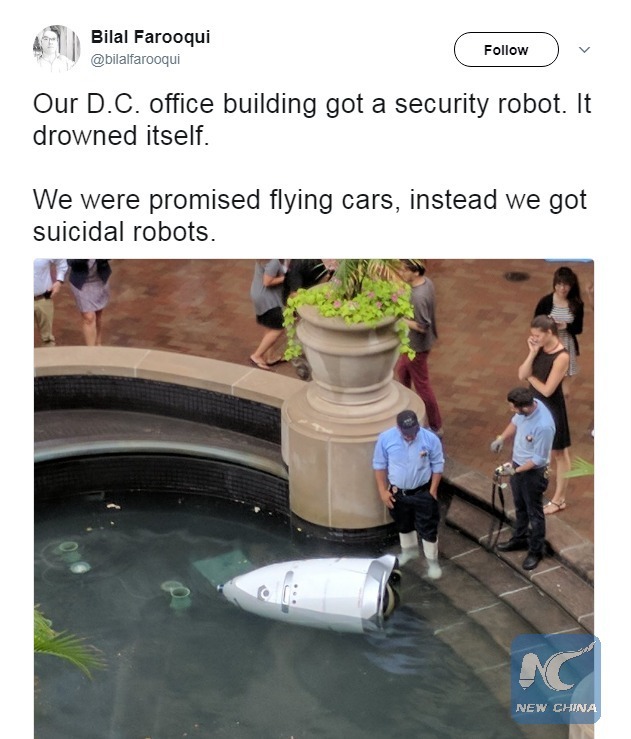 Twitter user Bilal Farooqi posted a photo on Monday of two men trying to salvage a fallen security robot from a fountain at his company's office building in Washington D.C.
"We were promised flying cars, instead we got suicidal robots," Farooqi tweeted. The security robot is a Knightscope K5 robot guard, reportedly tasked with patrolling the Georgetown Waterfront, a shopping and office complex along the Washington Harbor. With an appearance similar to R2D2 from Star Wars, the crime-fighting K5 stands at five feet tall and weighs 300 pounds. Designed to reinforce public law-enforcement and security services, this rocket-shaped model can turn, beep, and whistle as it roves the street and monitors for anomalies, and has been used in some malls and office areas across the United States. It appears this particular K5 guard might have thought it enough already while on duty Monday, and decided to "commit suicide" by rolling into a fountain and drowning itself. The incident went viral on social media. Some even joked whether the robot was simply going for a swim. However, it is not the first time that a Knightscope robot has run into trouble. In April, one of the robots was knocked over by a drunk man in Silicon Valley. A year earlier, another robot knocked down and ran over a 16-month old toddler in California.